Facebook rolled out 50MB express mobile wifi running at sh10 in Kenya. - Bana Kenya News, Real African Network Tubanane. 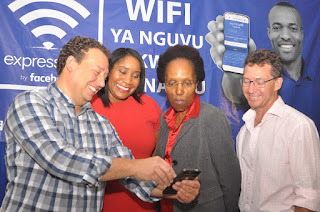 Home Technology Facebook rolled out 50MB express mobile wifi running at sh10 in Kenya. Facebook rolled out 50MB express mobile wifi running at sh10 in Kenya. 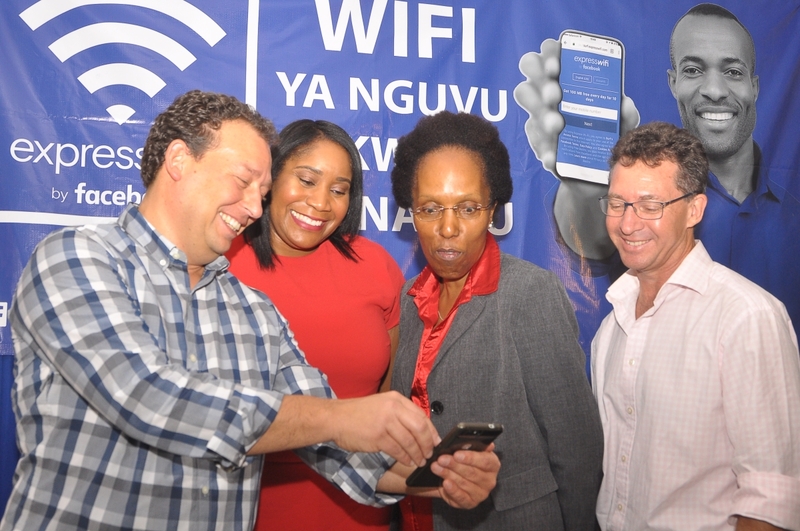 Mark Summer, Surf CEO (left), Uche Ofodile, Regional Head Africa Express WiFi by Facebook (second left), Dr. Katherine Getao, Secretary Broadcasting and Telecommunications, Ministry of ICT (second right) and Richard Hechle, CEO, Internet Solutions (right) launching Express Wifi in Rongai, Kajiado. The facebook tech Social media giant has taken Africa by storm. The Tech giant from the US has more than a quarter of its users are from Africa. They launched a cheap internet service in Kenya dubbed as "launched Express Wifi" yesterday at Nairobi, which will cost sh10 for 50MB. According to it representatives in Nairobi, the move will allow people surf at the lowest cost as possible. They said that they are not competing with Telecommunication companies in Kenya but providing support to the people in the country. “Kenya has a high internet invasion rate, but if you take a deeper look at how much usage that actually translates to, you realise that the number is actually low. Our goal is to grow that because we believe that there are inherent positive effects that come with that,” said Summer. “We are not here to compete. Instead, we want to be a part of the pre-existing ecosystem. We see Express Wi-Fi as a complementary service,” she said, adding that this has been determined by user performance patterns. The low-cost internet service was steered in India in 2016, after Internet.org’s primary initiative Free Basics, which was launched in 2015, came under fire for practices were believed “restrictive” by a section of India’s government as it allowed access to selective applications and websites. In partner with access Kenya now called surf Kenya, they will build internet zones in the Major cities and community centres across the country. People will be able to get information and be a par with the technological revolutions across the world. They Started rolling out the program in Nairobi and later they will roll out it in Mombasa then to Kisumu later this year.